Absolute Industrial Fabricators (AIF) is an ISO 9001:2008 certified converter of non-metallic flexible and rigid materials for a wide variety of OEM industries. Products include gaskets for sealing or environmental applications, electrical and electronic insulators, EMI/RFI shielding, and acoustic damping. Materials processed include Formex, Nomex, Mylar, solid rubber, open-cell polyurethane foam, closed-cell sponge, Silicone, and many others. AIF can die cut, stamp with hard tooling, laminate, slit, print, or heat form. As a 3M Preferred Converter, we can help you with your pressure sensitive adhesive (PSA) requirements. Our sales and engineering team can support the design and informational needs of your engineering departments. Watch our 2 minute video that aired on Fox Business Network. We continue to excel as a 3M Preferred Converter! As a supplier of 3M products for years, we have consistently offered their full line of industrial products –everything from tapes and adhesives to electrical insulaton. Over the years, our 3M volume grew, leading 3M to take notice; that is around the time when they asked us to become a Preferred Converter. In order to become a Preferred Converter, you must be asked by 3M and you must be willing to lead with their products. We are honored to maintain this relationship with 3M. What does it mean to be a 3M Preferred Converter? A few things. First, we have access to all of 3M’s products across all of their divisions, enabling us to provide greater solutions and more competitive pricing to our customers. We also have the opportunity to work jointly with 3M reps on OEM accounts, and we receive more training from the company so that we are more knowledgeable when it comes to the products and applications. Our partnership doesn’t end there—as a 3M Preferred Converter, 3M looks to us to be a leader and valued partner. We are able to be innovative in a number of ways, including proposing new products or new applications for their current product lines, as well as new ways in which the company could grow. We are excited to continue our relationship with 3M as a Preferred Converter, and we look forward to what the year will bring. And remember – we have the 3M products and solutions for your applications and needs! 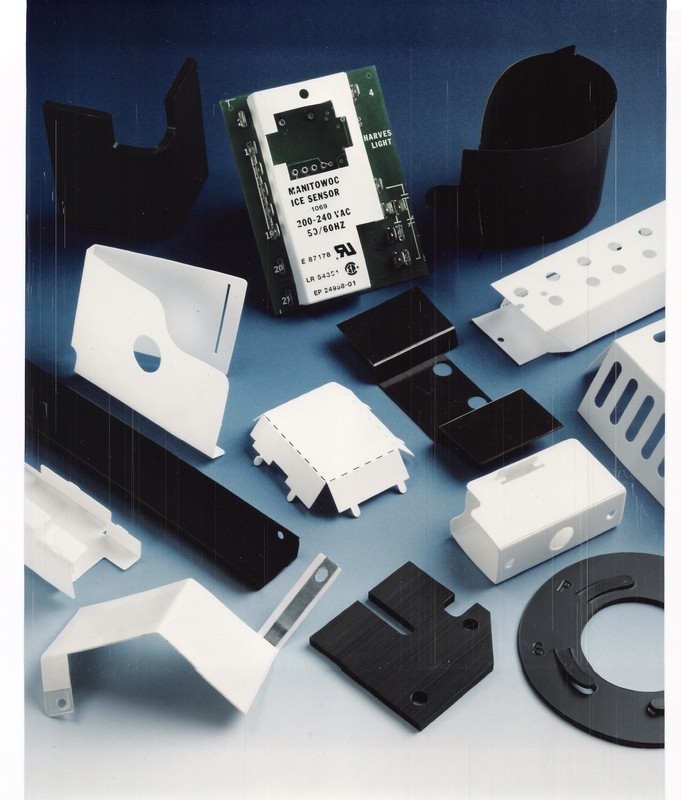 When choosing a component manufacturer, we know that you have many options. AIF continues to be a high quality fabricator of non-metallic materials. Our customers have trusted us to handle their component needs for many years and can also now count on us for an innovative material called Formex. We have successfully worked with all types of non-metallic materials that come in sheet or roll form, including plastic, fiber, rubber, sponge foams, laminates, pressure sensitive adhesives, and tapes. These materials can be cut and stamped into component parts for our customers. AIF also works with two well-known flame retardant fibers, Nomex ® and ITW Formex ®. Both products can provide electrical insulation in many applications below 115°C in electrical and electronic equipment. Nomex is more expensive, absorbs moisture, and the dimensions are susceptible to changing in humid environments. We encourage the use of Formex GK because it is half the cost of Nomex, has a higher dielectric strength, can be easily scored and folded, and is non-hygroscopic. Our expertise with Formex differentiates us from other component manufacturers. We were one of Formex’s first customers and have had a strong relationship with the brand for over 20 years. Absolute Industrial Fabricators has the material, engineering expertise, and experience to provide you with the highest quality components for your specific needs. We are flexible and able to meet customer demand no matter the order. Our engineers and employees are experienced when working with Formex, making us the best choice when choosing a component manufacturer. Here at Absolute Industrial Fabricators, we have experience working with all sorts of non-metallic materials. Whether it’s plastic, rubber, or sponge and foam, if it comes in a sheet or roll form, we can die cut or stamp the material into a high-quality component for our customers. We also frequently work with pressure sensitive adhesives and tapes, which are commonly being used in place of mechanical fasteners. Some other companies may claim to have the expertise needed to work with all of these materials, but there is one area where our experience cannot be matched. We’re talking about our work with ITW Formex GK flame retardant polypropylene. Formex material has a wide range of advantages over other materials used to make electrical insulation and barriers, like the ability to be folded repeatedly without cracking and its higher dielectric strength. Unlike traditional paper based insulators or aramid material, Formex GK is non-hygroscopic. It’s rated UL 94V-O and can be used up to 115 degrees C.
We have been working with this interesting material since the beginning, over two decades ago. AIF was actually ITW Formex’s first customer. When they began working on a design guide, we worked with them to figure out the best ways to use this material to manufacture working components. Since Formex was introduced, we have been developing the ideal way to die cut and fabricate parts with this material. So why go anywhere else for your Formex components? No one has more experience working with the material, and we also work with all of our partners to find the best ways to use their non-metallic materials to create the best possible component. When you need non-metallic custom, high-quality parts, you can rest assured that Absolute Industrial Fabricators will always deliver excellent results, on time. Here at Absolute Industrial Fabricators, we pride ourselves on being a great, reliable supplier of high-quality components for over four decades. We have taken a number of steps over the years to ensure that there will be no interruptions to your supply chain when you’re ordering parts from us. We know that there are a number of factors to consider when a supply chain manager picks a vendor, and we believe that our operating procedure leaves us uniquely suited to handle any order in a timely and efficient manner. At AIF, we’ve given our experienced customer service workers a lot more power than they may have at other similar companies. They can make decisions involving scheduling or pricing without the need to consult a long chain of management or higher-ups. As a result, we can quickly begin your job with the minimal amount of delays. This approach to scheduling has another benefit, allowing us to quickly respond to unexpected orders. We understand that, occasionally, your customers may place an order that needs to be shipped out quickly. When you choose us as your supplier, you can relax knowing that your needed components will be delivered on time. We use quick-change dies in our presses that can be swapped out in mere minutes, eliminating a potential delay and allowing us to get to work as soon as possible. We also make sure to leave room in our schedule for these “hot” orders, so you can be confident that we’ll be able to squeeze you in. One of our long-term customers found out just how flexible we can be recently. They called us on a Friday and said they needed components shipped out by the end of the day Monday. Most companies may not have been able to turn this order around on time. But we’re not most companies. A customer service worker took the order and talked to a production manager. Then we shipped those high-quality parts to our customer on-time. This is just one example of how a flexible supplier can accommodate you and ensure that your supply chain is never interrupted. We know that you have a number of options when you want to purchase non-metallic components. That’s why we’re going to tell you all about the Absolute Industrial Fabricators difference today and show you that there’s no reason to go anywhere else. First of all, we’re an incredibly easy company to work with. We’d even say that we’re capable of being completely invisible to our customers. That doesn’t mean we ignore you. That doesn’t mean that we’re hard to get a hold of online or on the phone. What that means is, because we’re doing our job right, you won’t even have to follow up with us. Just place an order and you can be confident that your components will be delivered on time. We understand that some of our buyers may not have the manpower required to follow up on every order they make and that having to do so could also add to costs, and eventually even result in a cost increase for their final product. That is why we make sure that every order, large or small, is manufactured efficiently. Place your order and focus on the other aspects of your business; you won’t have to worry that we forgot about you. The other things that set us apart from the pack are our advanced equipment and knowledgeable employees. We have a state of the art CNC flash cut knife cutting system that can be used to manufacture parts without the need for tooling. This technology is an ideal way to build prototypes or manufacture a small run of parts. In addition to that, we make sure that our front line people can help you at every step of the manufacturing process, from picking the right material to telling you about the functionality of the completed component. So see why we’ve been hailed as a high-quality, cost-effective supplier of custom manufactured non-metallic parts for over four decades. See the Absolute Industrial Fabricators difference for yourself today. If you know anything about us here at Absolute Industrial, you know we work with a variety of materials to make a variety of custom parts for our clients. Much of our work is on products that will go on to be parts of larger assemblies, performing various shielding or sealing functions in the electrical, communications, appliance, controls, and other industries. Often, these assemblies are constructed with fasteners. However, an increasingly popular option is to apply pressure sensitive adhesives to the back of our parts, eliminating the need for fasteners, often reducing the weight and procurement costs of the final product. Offering a variety of different types of PSA, we can not only supply the perfect type for your application, we can recommend which solution is best for the parameters that you specify. We have a working knowledge of the advantages and disadvantages of different types and compounds available, such as rubber-based, acrylic, foam, and others, and our engineers are happy to consult on the best use for any particular application. We are also a 3M preferred converter for pressure sensitive adhesives – a distinction not many of our competitors can assert. From material options, to assembly options, to adhesive type, Absolute Fab has the experience and engineering expertise to recommend and provide you with the best components and assemblies for your application. Give us a call, or say hello on social media – we’d love to hear from you.